September had 2,796 plug-in vehicle registrations, which was the market’s best result since 2016. That translated into a plug-in vehicle (PEV) share of 9.5% in the country. The result pulls the year-to-date count to 14,977 units, with the 2018 PEV share growing to 4.1%. Of course, maybe the higher taxation of expensive BEVs next year has something to do with it. … Then again, while others are still presenting their unavailable high-end EVs (Mercedes, Audi …) or having troubles ramping up production (Jaguar), Tesla is in place to profit from this sales surge from the start. Call it first mover advantage. Back to September sales, the new generation of the Nissan Leaf (292 registrations) is doing wonders for the nameplate sales, as the Japanese hatchback already sold 4 times more units in the first 9 months of 2018 than it had in the whole of 2017. Elsewhere, the #4 BMW i3 also shined, by delivering 172 units (1 had a range extender). That was the model’s best result since 2015. The Hyundai Ioniq Electric closed out the top 5 with 146 registrations. 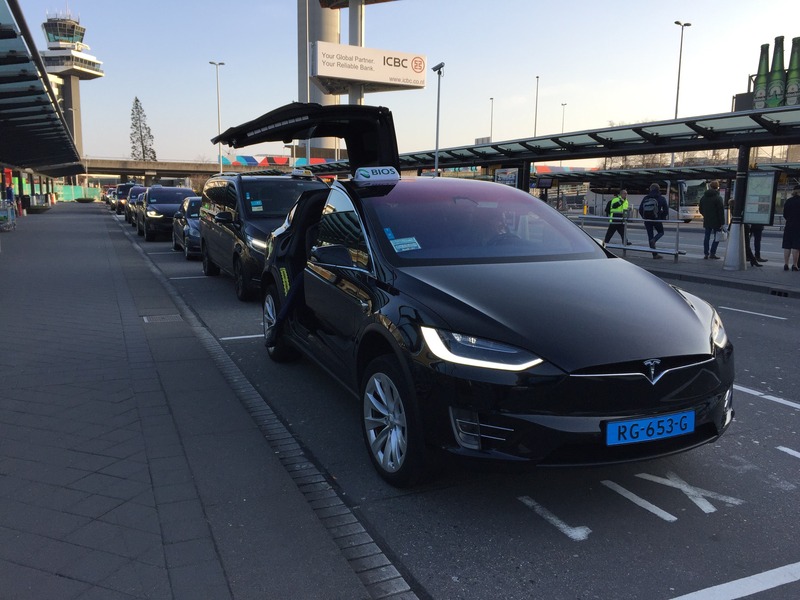 Looking at the 2018 ranking, while the Tesla Model S (1,052 units in September, a personal best) can already plan the 2018 Best Seller ceremony, its Model X (593 units, also a personal best) sibling rose to third place, switching places with the VW e-Golf. It is now racing the Nissan Leaf for the second spot on the podium, which would repeat the #1 plus #2 win that Tesla had in 2017. In fact, the real race that Tesla has in this market is not against other electric cars, but with the gas & diesel competition, and in that field, Tesla also had good news. While the Tesla Model X was already head and shoulders ahead of the competition (#1 Model X — 1,912 units; #2 Volvo XC90 — 717 units), last month, the Tesla Model S surpassed the BMW 5 Series and became the best selling car in the E-segment (“full-size vehicles,” in US language). The Model S’s 3,379 units now being well ahead of the 2,729 registrations of the second placed BMW 5 Series. On other news, the Opel Ampera-e (European Chevrolet Bolt) climbed to #7, surpassing the Renault Zoe while the French hatchback scored its worst performance (31 units) in over a year, which makes us wonder what’s happening to Europe’s second best selling EV in Dutch lands. Are local buyers not into the Zoe? I mean, with BEVs representing 87%(!) of the PEV market, the Zoe should be thriving here. Outside the top 10, there were some interesting developments, with the Hyundai Kona BEV jumping six positions to #12 (top 10 soon? ), the BMW 530e surprising everyone by jumping three places to #11, and the Smart Forfour ED up one position, to #17, thanks to a record performance of 26 deliveries. And there is a new (well, old) face in the top 20, with the Volvo XC90 PHEV now in #19 thanks to 39 units, its best result in 20 months. Outside the top 20, the Jaguar I-PACE registered 21 units last month, which is not much, considering the thousands of reservations that the car has in this market, but it was just enough to make it the best selling Jaguar in the Netherlands. In the manufacturer ranking, Tesla (36%, up 6%) is the undisputed leader, with Nissan (14%) hanging on in second place while the race for third has Hyundai (9%) securing the podium by a thread for the moment, just 2 units ahead of Volkswagen. Hyundai is 27 in front of potentially competitive BMW, but with the Kona BEV set to grow significantly in the coming months, the Korean should keep the bronze medal until the end. Jose Pontes Always interested in the auto industry, particularly in electric cars, Jose has been overviewing the sales evolution of plug-ins through the EV Sales blog since 2012, allowing him to gain an expert view on where EVs are right now and where they are headed in the future. The EV Sales blog has become a go-to source for people interested in electric car sales around the world. Extending that work and expertise, Jose is now a partner in EV-Volumes and works with the European Alternative Fuels Observatory on EV sales matters.